The burden of two very different personnel systems, and a large and growing cohort of appointees exempt from the disciplines of either, is taking a real toll on the Department of State—and the Foreign Service. 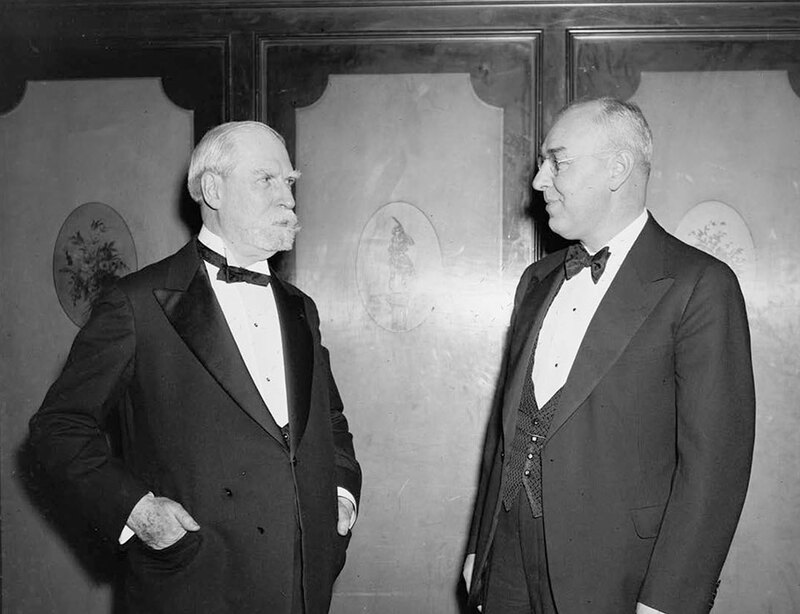 Henry M. Wriston, at right, the newly inaugurated president of Brown University, was introduced by former Secretary of State Charles Evans Hughes, at left, at the school’s alumni dinner at the Mayflower Hotel in Washington, D.C., on March 15, 1937. The U.S. Department of State is one of the few agencies—the Department of Defense is another—with large numbers of employees in different personnel systems. The two systems, Civil Service and Foreign Service, have different employee benefits, protections, rights and obligations. Conflicts between the systems have long been evident. From the 1940s into the 1970s, a series of commissions, committees and panels of experts urged the department to move to a single structure. The department’s leadership agreed with these recommendations, but time and again found reasons to delay or avoid acting on them. State eventually abandoned the effort to integrate the two services, but not the search for ways to strengthen a sense of teamwork and unity of purpose. The dual system, with its administrative complexities and inevitable inequities, continues to burden the department’s managers. The roots of the dual system reach to the 18th century, when Thomas Jefferson, the first Secretary of State, created different services to perform different functions: a diplomatic service to maintain political relations with foreign powers; a consular service to protect American seamen and other citizens, and attend to American maritime interests generally; and a home or departmental service to take care of matters in the capital. “The great rule of conduct for us in regard to foreign nations,” said President George Washington, “is, in extending our commercial relations, to have with them as little political connection as possible.” In line with this doctrine, the consular service far outnumbered the diplomatic service, which far outnumbered the home service. As late as 1900, when the United States was an emerging world power with a two-ocean navy, a colony in the Philippines and a rising global financial center in New York, there were only 41 diplomatic missions compared with 318 consular establishments (not counting some 400 more consular agencies). To oversee and support this far-flung network, filled with patronage appointments, the department had just 91 employees, including the Secretary of State. At the turn of the 20th century, according to historian Tyler Dennet, the Department of State was “an antiquated, feeble organization, enslaved by precedents and routine … remote from the public gaze and indifferent to it.” For diplomats and consuls alike, salaries were low and allowances, other than modest sums for rental of office space, essentially nonexistent. In 1900 the U.S. had 41 diplomatic missions and 318 consular establishments—and just 91 domestic employees, including the Secretary of State. Business and shipping interests complained that the consular service, in particular, served them poorly. Wilbur Carr, then head of the department’s consular bureau, began working with Representative John Rogers of Massachusetts in 1919 to produce a bill to “amalgamate” and professionalize the consular and diplomatic services. The Foreign Service Act of 1924, generally known as the Rogers Act, passed after three years of debate, combining the two services into a single Foreign Service of the United States, with entry by competitive examination, promotion by merit, mandatory retirement, a pension system and other features that remain in place today. The personnel structure of the Foreign Service as conceived in the 1924 Act was a flow-through system, bringing new members in at the bottom and moving them through ranks that emptied with promotions or retirements, by reason of age or time in grade. The system was rotational, with members expected to move periodically from station to station. Officers in the Foreign Service would compete against each other, with the top performers advancing and the worst performers facing possible dismissal. By contrast, the Civil Service system, introduced to the Department of State in the early 20th century through a series of executive orders, was static. Members did not necessarily enter at the bottom, and they advanced in grade only by moving to more highly rated—more challenging and more responsible—positions. They had a high degree of job security and were not expected to move periodically from one assignment to another. The principal difference, however, was that members of the Foreign Service expected to spend roughly 90 percent of their time overseas. Members of the Civil Service, with a few exceptions, worked only in the United States. The exceptions were outside the State Department. Congress established a Foreign Commerce Service in the Commerce Department (1927-1939) and a Foreign Agricultural Service in the Department of Agriculture (1930-1939), and provided overseas postings for employees of the Interior Department’s Bureau of Mines (1935-1943). Employees of all three agencies remained in the Civil Service when sent abroad. When austerity and war later shut both organizations down, their members were reassigned to the Department of State and welcomed into the Foreign Service. Congress revived the FAS in 1954 and the FCS in 1980, and both services adopted the Foreign Service system after passage of the Foreign Service Act of 1980. World War II broke the Foreign Service, as it broke so many institutions. Recruitment was halted to avoid interference with the military draft, leading the increasingly short-handed department to implore its senior officers to stay on the job as long as possible. Under the Rogers Act, the percentage of officers in each of the top six (of nine) ranks was strictly limited: no more than 6 percent, for example, could be in Class 1, the highest rank, and no more than 14 percent in Class 6. The percentage caps, lifted finally in 1945, effectively blocked promotions. As officers grew frustrated, many resigned to join the armed forces. But the hiring freeze in the career service had made that thinking irrelevant. In January 1946, the 976 officers in the Auxiliary outnumbered the 820 officers of the regular career corps. Under the Manpower Act of 1946, the department held examinations that brought 360 new officers into the career service at all but the most senior grades. The new officers came from the Auxiliary, the military and the Civil Service, or had been clerks and vice consuls in the non-career Foreign Service. Despite repeated calls to move to a unitary personnel structure, like most other federal agencies, the State Department has refused to act. A July 1945 Washington Post editorial called for “a complete overhaul and radical expansion of the State Department,” including “democratization of the Foreign Service.” The Bureau of the Budget urged Secretary of State James F. Byrnes to place the department’s Foreign Service and Civil Service employees in a single system. Foreign Service personnel, said the BOB, would benefit from more time in the department, and Civil Service personnel would gain from tours abroad. The bureau also recommended recruitment and hiring into the middle and upper grades of the Foreign Service, to break down its closed, elite structure. It argued, as well, for more attention to building leadership, supervisory and administrative skills through systematic training for all of the department’s employees. Seldin Chapin, head of the department’s Office of Foreign Service (a position roughly equivalent to today’s director general of the Foreign Service), led a study group that proposed a 10-year transition to a consolidated service whose members would all serve at home and abroad. But consolidation, even over a decade, would surely have met resistance from the career Foreign Service, and likely from the home service as well. State management did not want to deal with such friction, and turned aside Chapin’s recommendation. Instead, it directed him to work on legislation to preserve a separate Foreign Service. The Foreign Service Act of 1946 evolved from Chapin’s efforts. It created a service that included an officer corps, a staff officer corps (providing a career for the non-career clerks) and a reserve. Reserve officers held commissions for up to five years and were often chosen for their specialized skills and knowledge. Staff, reserve and regular officers were all on the same pay scale and received similar benefits. The foreign and home services remained separate, but members of the home service, the staff officer corps and the reserve corps with at least four years of experience (or three years for those over the age of 31) could seek lateral entry into any but the highest level of the Foreign Service. Chapin, a career FSO, was a graduate of the Naval Academy. His legislative draft introduced several features of the Navy’s personnel system to the Foreign Service, notably “promotion up or selection out”—mandatory retirement of regular (but not staff or reserve) officers repeatedly passed over for promotion or repeatedly ranked at the bottom of their class. The 1946 Foreign Service Act created a service of great flexibility, able (at least on paper) to add and subtract personnel as needs changed. But the legislation left untouched the managerial complexity of a Department of State with two personnel systems, and failed to provide overseas exposure for the home service or Washington assignments for the Foreign Service. Its passage turned out to be just the beginning, not the end, of a long period of organizational flux and debate. A series of blue-ribbon panels, beginning with the Hoover Commission of 1947-1949 (chaired by former President Herbert Hoover) urged the department to restructure itself. Citing “a cancerous cleavage” between the Foreign Service and the Civil Service in the department, the commission’s recommended solution was clear: “The personnel in the permanent State Department establishment in Washington and the personnel of the Foreign Service above certain levels should be amalgamated over a short period of years into a single foreign affairs service obligated to serve at home or overseas and constituting a safeguarded career group administered separately from the general Civil Service” [emphasis in original]. Dean Acheson, the former under secretary and future Secretary of State, was a member of the commission and “heartily concurred” with this view. But when he became Secretary of State in 1949, he fudged by appointing New Deal lawyer James H. Rowe to head a new commission to study the report of the old one. Rowe’s report reached his desk in 1951 with another recommendation for merging the Civil and Foreign Services. It cited a survey that found that 81 percent of the department’s civil servants and 59 percent of its Foreign Service officers supported an integrated service—albeit with caveats. Members of the home service wanted assurances they would not be penalized if they chose not to go abroad; FSOs feared loss of pension and retirement benefits and worried about a decline in standards. Secretary Acheson was even more reluctant to act in 1951 than he had been in 1949. Senator Joseph McCarthy’s witch hunt was in full cry, and the department was in turmoil. Acheson (referring to himself in the third person) later wrote: “It would seem understandable that the Secretary regarded a far-reaching and basic reorganization of the status of every person in the Department [of State] as General Grant might have regarded a similar proposal for the Army of the Potomac between the Wilderness and Appomattox.” So, as had happened under Secretary Byrnes, the moment for uniting the services passed again. For all its virtues, the Foreign Service Act of 1946 did not address key organizational problems. President Dwight Eisenhower’s Secretary of State, John Foster Dulles, had far fewer qualms about disrupting the department. In 1954 he appointed a committee of eight under Chairman Henry Wriston, president of Brown University, to review past reports and recommend action that would be swift and decisive. Just five months after the committee’s first meeting, its work was done, and Secretary Dulles accepted its main recommendations. The Wriston Committee called for the integration of the Foreign Service and the home service “where their functions and responsibilities converge.” Implementation would entail making some 1,450 home-service positions in Washington available to members of the Foreign Service, and admitting a like number of home officers from the Civil Service to the Foreign Service, along with a large number of new recruits. The Foreign Service officer corps was to grow from around 1,300 to nearly 4,000. Congress passed the necessary legislation in August 1954, and enacted related reforms the following April. Although in surveys FSOs claimed to favor integration of the Civil and Foreign Services, in practice many objected to bringing in new officers at any but the lowest grades. And many considered members of the Civil Service unworthy of joining their ranks. Crockett enlisted the support of Representative Wayne Hays, D-Ohio, chairman of the House Foreign Affairs Committee. In 1965 Hays produced a bill that would have placed nearly all employees in State, the Agency for International Development and the U.S. Information Agency in a unitary Foreign Service. The bill would have added to the regular, staff and reserve officers a new category, foreign affairs officers, comprising professionals who would serve primarily, but not exclusively, in the United States. His bill passed the House but died in committee in the Senate. Hays blamed Senator Claiborne Pell, D-R.I., a member of the Committee on Foreign Relations and a former FSO. Pell, said Hays, “didn’t like the selecting-out thing.” Crockett blamed the often-reported animosity between Senate Committee Chairman J. William Fulbright, D-Ark., and his erratic House counterpart. Whatever the reasons, the legislative path to integration had reached its end. William Macomber, a political appointee, took Bill Crockett’s job as State’s under secretary for management in 1969. Nominally a Republican, he had already been Kennedy’s ambassador to Jordan and had served as Dean Rusk’s assistant secretary for legislative affairs in the late 1960s. Macomber used administrative measures to create a new Foreign Service personnel category, the foreign affairs specialist, to which members of the Civil Service and the Foreign Service staff corps could convert. The FAS corps was a hybrid, taking rank-in-person, selection-out and mandatory retirement from the Foreign Service system, but without a requirement for worldwide availability. Foreign affairs specialists were expected to serve primarily in the United States. The FAS program was short-lived. Federal courts accepted the position of the American Federation of Government Employees that the program had no basis in law and shut it down in 1973. Still, it had been popular. Hundreds of civil servants, especially in the U.S. Information Agency, had converted to FAS before the court decision, and many, including the head of AFGE’s USIA local, chose to remain foreign affairs specialists to the end of their careers. The FAS corps was effectively the last time the single-service impulse took tangible form in the Department of State. (The National Performance Review, a study prepared in 1993 under the leadership of Vice President Al Gore, urged USAID to bring its Civil Service and Foreign Service employees into a single personnel system modeled on the Central Intelligence Agency, but that idea was not pursued.) In 1975, Foreign Service Director General Carol Laise told Secretary of State Henry Kissinger that the drive toward a single-system model had failed and should be abandoned. Soon after, yet another blue-ribbon commission, this one convoked by Congress and headed by retired Ambassador Robert Murphy, came down in favor of a dual-service system, a position endorsed by Deputy Under Secretary for Management Larry Eagleburger. The years since passage of the 1980 Act have not been kind to the position of the Foreign Service within the Department of State. In 1988, the department had 9,232 full-time employees in the Foreign Service and 4,677 in the Civil Service, a ratio of 2 to 1. By 1998, the department had cut its Foreign Service staff by 16 percent, to 7,724. The number of civil servants, however, had increased by more than 6 percent, to 4,977, so the ratio had fallen to 1.6 to 1. Wristonization was completed in just four years, but few found the result satisfactory. To repair the damage to the Foreign Service, Secretaries of State Colin Powell and Hillary Rodham Clinton undertook programs—the Diplomatic Readiness Initiative and Diplomacy 3.0, respectively—that secured congressional support for increased funding and additional positions for Foreign Service and Civil Service employees in the Department of State. Under these programs, the Foreign Service grew more rapidly than the Civil Service, but overall personnel data tell a different story. By 2009, State employed 12,018 members of the Foreign Service and 9,487 members of the Civil Service, a ratio of just 1.3 to 1. Throughout this period, the emphasis that AFSA and other foreign affairs organizations placed on the unique characteristics of the Foreign Service clashed repeatedly with the emphasis of the department’s leadership on teamwork and unity of purpose. AFSA and other organizations were quick to criticize Secretary Powell when he changed the annual Foreign Service Day celebration to a more inclusive Foreign Affairs Day in 2001 and renamed the Foreign Service Lounge the Employee Service Center. The Foreign Service Act of 1980 is now 34 years old, the age of the Foreign Service Act of 1946 when it was replaced. The drafters of the 1980 legislation had no great admiration for the dual-service system, but like Secretaries Byrnes, Acheson and Rusk, they concluded that keeping it was preferable to attempting change. With two very different personnel systems—not to mention a large and growing cohort of appointees exempt from the disciplines of either—the Department of State lacks the cohesion and vibrancy Sec. Kerry has called for. The department’s managers, its Foreign Service and Civil Service employees, and its congressional committees of jurisdiction should start now to look for ways to harmonize the systems, with renewed dedication to merit principles, equal opportunity, and a fair balance of rights and obligations. Only fundamental change can give the Secretary what he wants and deserves. Harry Kopp, a former FSO and international trade consultant, was deputy assistant secretary of State for international trade policy in the Carter and Reagan administrations; his foreign assignments included Warsaw and Brasilia. He is the author of Commercial Diplomacy and the National Interest (Academy of Diplomacy, 2004) and the co-author of Career Diplomacy: Life and Work in the U.S. Foreign Service (Georgetown University Press, 2011). He is now writing a history of the American Foreign Service Association, and some of the material in this article will appear in different form in that work.